A drone hovers near a school run by TT Aviation Technology in Beijing. 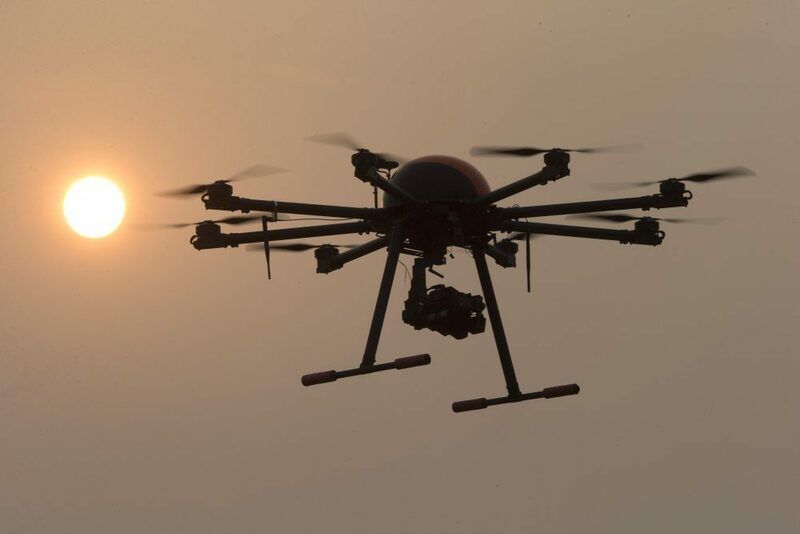 TT Aviation Technology Co. is part of a new cottage industry sprouting up in China, where drones are being deployed in rising numbers. Photo by Ng Han Guan/Associated Press. Even before the Wright Brothers launched at Kitty Hawk in 1903, fantasies about what the industrial revolution meant for the future of warfare became etched in Western culture. From Ignatius Donnelly’s 1890 Caesar’s Column to H.G. 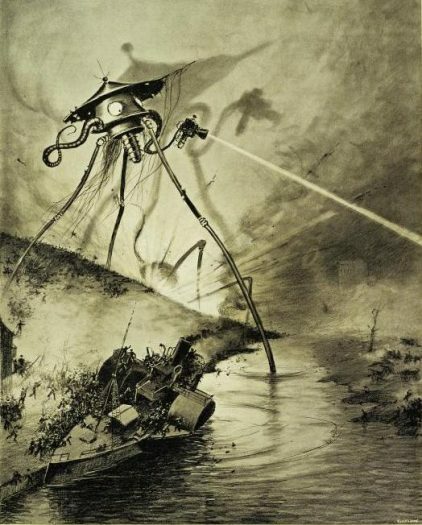 Wells’ 1897 The War of the Worlds to Mark Twain’s 1899 A Connecticut Yankee in King Arthur’s Court, turn-of-the-century novelists imagined apocalyptic machines reaping vast destruction on dense urban populations. In 1898, one Polish military leader described how future war would involve balloons dropping “explosive substances” on unsuspecting people far removed from any front. “Le Combat dans la riviere” (1906). Illustration by Alvim Corrêa (1876-1910) for a work by science fiction author H.G. (Herbert George) Wells (1866-1946). Image courtesy of the Spencer Collection of the New York Public Library Digital Archive. Michael Sherry, a leading historian of air power in the 20th century, has argued that while early aviation technologies had limited practical applications, those limitations were not always understood by military commanders and political leaders. Fantasies about air power’s destructive potential outstripped the reality of air power. But before long, the experiences of war enabled military planners and national leaders to experiment with air power, giving the world an early taste of the terror. World War I introduced the practice of air raids on something approaching a mass scale, as dozens of German “Gotha” and “Zeppelin” raids on London killed an estimated 1,413 civilians. The world, he concluded, was entering an age of “total war,” with civilians the prime target of any offensive military operation. Similarly, cyberwarfare adds a whole other dimension to the concept of total war, using unseen tools almost anywhere on earth to cause mass civilian casualties and mass panic. The coming of World War II put many of the post-WWI predictions to the test. And tragically, many proved prescient. Advanced aviation technologies coupled with fascist militarism helped warfare assume an unprecedented destructive scale. During Spain’s Civil War, Franco’s bombers killed thousands of civilians in attacks on Barcelona, Guernica, and other Spanish cities. In Canton, China, Japan’s air raids killed thousands of civilians in the mid-1930s. Air power altered people’s conceptions about the constraints of time and space during military conflicts. Abraham Lincoln had once predicted that “the armies of Europe and Asia … could not by force take a drink from the Ohio River or make a track on the Blue Ridge in the trial of a thousand years.” The United States had long seen itself as immune from the military calamities that had befallen other nations, whose borders were in proximity to one another. The twin-ocean barriers on America’s coasts no longer appeared to protect the United States from the advances in air power. Fears of bombs falling on the continental United States soared in the 1930s and early 1940s. President Franklin D. Roosevelt, who had served as Assistant Secretary of the Navy during World War I and had long admired sea power, concluded that modern aviation had upended military doctrine and put millions of U.S. civilians in harm’s way in their homes. The advances in aviation technologies meant that “so-called impregnable fortifications no longer exist,” FDR warned Americans in May 1940. (Cyberwarfare and online recruitment of potential terrorists have further lowered the protective walls of fortress America). Anybody seeking to understand what war might look like in the cyber age should consider the disruptive force of air power and the revolution it wrought. … War has the power to quickly transform our technological fantasies and anxieties into devastating, hard-to-control realities. FDR’s repeated warnings did not prevent Pearl Harbor. But the war that ensued—which included the Allied firebombing of Dresden and Tokyo, where hundreds of thousands of civilians died, followed by the atomic bombing of Hiroshima and Nagasaki—matched some of the most horrific nightmares of early fantasists about air power. In the years since World War II, air power has not always proven decisive, of course. During the Vietnam War, the United States dropped more tonnage of bombs than had been dropped by all combatants in World War II. Yet the most powerful military on earth lost to a determined, fierce guerrilla army fighting to defend its native soil. The Bush Administration’s “shock and awe” air campaign at the start of the 2003 Iraq War wrought so much destruction that it arguably set the stage for the Iraqi Civil War that ensued two years later. This history should provide this cold reassurance: It is highly unlikely that any single technology—including cyberwarfare—will prove decisive in military campaigns of the future. But the history of air power also strongly suggests that at some point in the future, fantasies about cyberwar and the actual practice of cyberwar will merge. So human beings, in contemplating how cyberwar may change the character of warfare itself, will be better off if we allow our fears to inspire our thinking, and anticipate new perils and consequences before they show up at all of our doorsteps. Matthew Dallek is an associate professor at George Washington University’s Graduate School of Political Management and author of Defenseless Under the Night: The Roosevelt Years and the Origins of Homeland Security. Berggruen Institute, civilian, cyber, Cybersecurity, digital technology, fantasy, History, technology, what does war look like in the cyber age?